A Passion for Irish Setters. I have always had a fondness for gundogs. The love of dogs dates right back to my birth in 1963. Growing up in dogs' baskets and surrounded by a large number of dogs, I was “infected” at a very early age, and happily I never got over it. 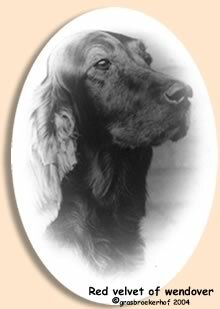 During the first meeting most people cannot believe that besides a beloved partner and two daughters, that there are also seven Irish Setters and two cats in house. And is that normal?? Of course it is! After all, it could have been seven children or ten parrots. My motto is: Try to respect everyone’s passion. 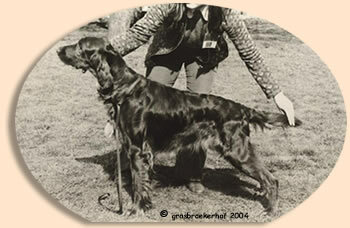 The interest in the Irish Setter was stimulated in a positive way by a close pair of enthousiastic parents. I gained a lot of unforced experience in the showring at a very early age and visited many a show in both the Netherlands as the rest of Europe. When my parents decided after 21 years to stop with their kennel “van de Grasbroekerhof” in 1992, I didn’t have to think long. As far as I was concerned it was obvious that I should take the kennel over and insure that what my parents had built up through the years would not be lost. In this way I particularly wanted to maintain the Wendover bloodline. Wendover Havoc (son of Wendover Souvenier x Wendover Red Jenny). You can find more information under "Our Setters". The passion for the Irish Setter has made me great many good and warm friends and contacts both in the Netherlands as abroad. It is fine to realise that other breeders think with you and that aspiring owners become enthousiatic and stay so. I value these insprining and motivating experiences greatly. It give a good feeling to see others infected by the Setter virus, something that happened to me since I was a child .